This blog should be called "The Adventures of a Fabric Junkie!". I am passionate about fabric, threads, colours and textures. I can record my crazy quilting, sane quilting, embroidery and everything else that I consider important in my life. Photo shows my block for the Hurricane Katrina fund-raising quilt "All That Jazz". I arrived home from work today to find a yummy looking big parcel on the kitchen bench. 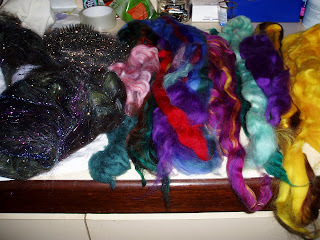 I bought a lot of mixed fibres on eBay from Teresa Simons of Mountain Shadow Ranch. The photos just don't do these beautiful soft fibres justice, especially the Mystery Batt. 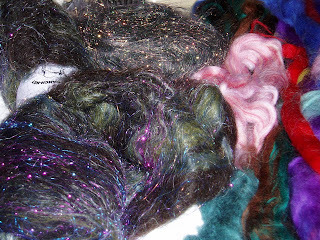 My mystery batt which Teresa had called "Wizard's Magic" contains several different black and grey fibres (no two of her mystery batts are the same mixture) intertwined with vivid sparkly hot pink, turquoise, purple and gold Angellina fibres. I also bought a bag of Dragon Waste which come in the most gorgeous colours and also a bag of "Forest Green" Angellina Fibres. I am really thrilled with my booty and can hardly wait to start making fabric now. I remember buying wool tops before but these are from Cotswold sheep and are soooooooo soft! When I did the silk paper making workshop with Judith Pinnell and Nancy Bellesteros several years ago, I remember laying the fibres one way (north - south), then a second layer over the top of the first at right angles (so east - west) and finally a third layer in the same direction as the first. Then we manipulated the fibres with the textile medium. It made a lovely fabric about the thickness of lightweight felt. Ohhhh Viv they are yummy and they look so soft. Lucky you. I will be waiting to see what you do with them...grin. Off to check out the link - thanks for sharing. Hey, these look great Viv... lots of playing there...have fun. Can't wait to see what you'll do with them. The colours are just so scrumptious Viv, what a wonderful buy. Look forwards to seeing what you create. Hi Vivienne in Australia ... from Vivian in Canada! Those fibres are gorgeous! I have a friend who does nano felting with fibres like these. It is done with a layer of light nylon fabric in the middle and comes out as light as a feather ... and it shows the fibres off beautifully. If you go to my blog and down to my trip to Lethbridge you will see a sample of her work. 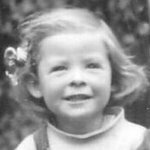 Viv was born in Perth, Western Australia and is married to Eddie, who was born in Hull, Yorkshire and has lived in Australia since 1972. Between us we have three sons and two daughters, four grand-daughters and two grandsons. We are fortunate to call both Perth and Hull, home. Eddie is a member of AMRA and NERA, Viv belongs to CQI, Southern Cross Crazies, CQEmbellishers and WeeCreations.